WHAT IT IS: A nail-art trend in which people are getting manicures to make their talons look like Swiss cheese. 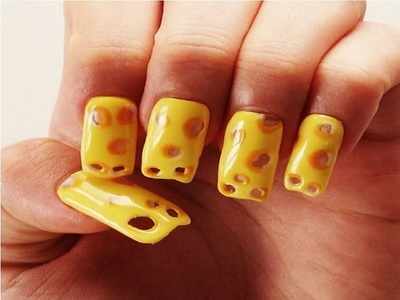 HOW IT STARTED: It all started when a Japanese food site created a video showing people how to get a cheese manicure. Since then, people have been trying to replicate the look or get their own versions. HOW IT’S DONE: In the viral video, the manicurist starts by applying acrylic nails with holes and uneven tips, and then paints on a bright-yellow nail polish. Then, dark orange and white nail polish is applied to contour and highlight the holes, after which it’s sealed with a glossy topcoat.